The second piece of paper I have earned in my post-secondary education is far more interesting than that first piece. I am now a qualified pastry chef! Ask me five years ago, I would not have even dreamed of this journey, and even if I did, I would not have dreamed it possible. It’s funny how things work out. 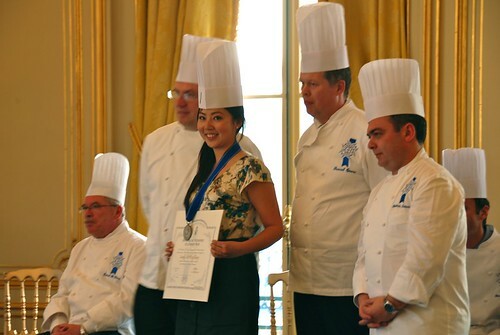 I can’t even tell you when the idea of pastry school came into my head, let alone the name Le Cordon Bleu. Somehow within the carpeted, salmon-coloured walls at work, the idea began as a tiny seed in my head and blossomed into something that kind of took over my life, literally. I am not sure how much I really have learned in the past six months, but a chef is someone who does this for life, so I guess I have the rest of my life to find out just how well I did. Surprisingly, though, I finished second in my class! I guess it helped that I became more confident in the kitchen as the course progressed, so I wasn’t as flustered by the chefs by the end. It was a nice surprise to end my stay in Paris. 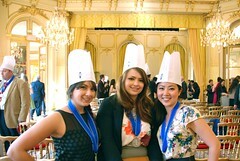 The top 5 pastry grads – we’re chefs!! The ceremony itself took place at a fancy old-fashioned club right on Rue Faubourg St-Honoré in Paris, Cercle de l’Union Interalliée. 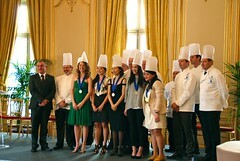 My biggest regret (and slight annoyance, really) is that we only had two out of five teaching pastry chefs at the ceremony – a newbie, and the chef for Basic Pastry. Therefore, we didn’t even get proper commentary on what the chefs thought of the graduating class and our final exam work. I’m sure I wasn’t the only one disappointed about the chef turnout. Many parents had flown in from all over the world to attend this graduation, only to find that the chefs their children often spoke of weren’t even there! 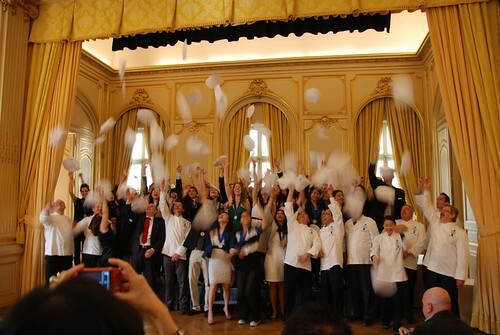 After a few speakers, we received our diplomas, cheered on the top 5 students in cuisine and pastry, and all lined up on stage for a hat-throwing photo. Afterwards, the canapés and champagne reception was most disappointing – super crowded with not-so-great food. C’mon, you’d think they would’ve tried harder knowing they were serving culinary students! We made a quick escape out into the sunshine and wandered through the Jardin des Tuileries over to the Lizard Lounge, an American bar in the Marais serving the best nachos in town. Afterwards we continued along to Pozzetto, a new favourite gelateria in the Marais. Now that was proper celebration food! So proud of you Sandy!! You are I’ve of my main inspirations…love that you accomplished this and that you finished 2nd!